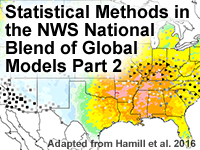 This lesson introduces users to the statistics used in generating the various weather element forecasts included in version 2 and 3 of the U.S. National Weather Service (NWS) National Blend of Global Models (NBM). This Level 3 lesson is intended for forecasters and users of NWS forecast products; some prior knowledge of numerical weather prediction and statistics is useful. Learners will be introduced to the analysis of record used to calibrate the NBM’s bias and error estimates. Learners will also explore the bias correction, weighting, and post-processing procedures used to produce the forecasts. Many questions were asked before the material had been covered. Test questions were too difficult. They need to be more clearly related to the covered material. Statistical output is already not conducive to learning and having to read through this content is slow. Make this lesson an instructor led course and/or more interactive, and perhaps dumbed-down a bit, would make it much easier to comprehend. originally did better on the pre-quiz! Hard to retain a large amount of key information. This could been done in two separate lessons to retain mre. I felt the lesson did not have enough information to answer correctly the questions and answers as they were written. Think you should have some examples actually working through a forecast for each element. This is particularly true for wind direction.